Trabeculectomy also referred to as a guarded filtration procedure, is the most common surgery performed to reduce internal eye pressure. The surgery creates an alternative pathway for fluid to leave the eye. Trabeculectomy is preformed at The Eye Surgery Center under monitored anesthesia care (MAC) and a local injection around the eye. Under the operating microscope the clear movable conjunctiva covering the eye is opened and a partial thickness small flap is made in the upper part of the sclera (white fibrous tissue). Under the base of this flap a small opening is made to allow internal fluid (aqueous) to leave the eye. The sleral flap is then sutured down and adjusted to control fluid outflow. The conjunctiva is the sutured closed watertight. Escaping aqueous forms a blister or “bleb” under the eyelid from where it is absorbed into the blood stream. Antimetabolites are frequently used during trabeculectomy to prevent the bleb from scarring closed. Mitomycin-C and 5-fluorouracil (5-FU) are the most commonly used antimetabolites for glaucoma surgery. 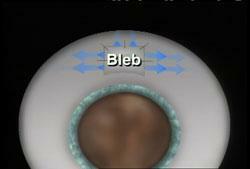 After surgery patients are followed very closely to monitor the bleb function. Anti-inflammatory drops are required for weeks, sutures may need to be adjusted or cut to enhance outflow. Many patients may need some additional glaucoma medications to achieve low pressures; surgical revisions of dysfunctional blebs may be necessary. If you would like more information about this procedure you can make an appointment orcontact the office for additional information. Click here for more information about the Primary Eye Care Surgery Center.